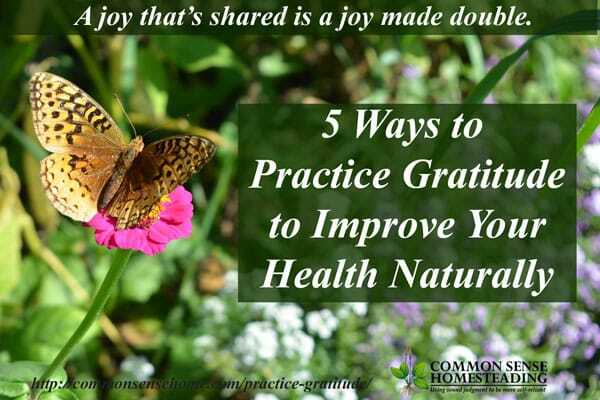 We all know that practicing sports or other hands on skills like sewing or singing can improve your skill level, but did you realize the same principle applies when you practice gratitude? What the heck does this have to do with homesteading? There's a biofeedback loop between you mind and your body. The more we can focus on the positive aspects of our lives and create positive emotions, the better our body functions. Grateful people have also been found to sleep better and be more optimistic, both of which boost the immune system. Dr. Lisa Aspinwall at the University of Utah found that optimistic students maintained higher levels of blood cells that protect the immune system compared to their pessimistic classmates. 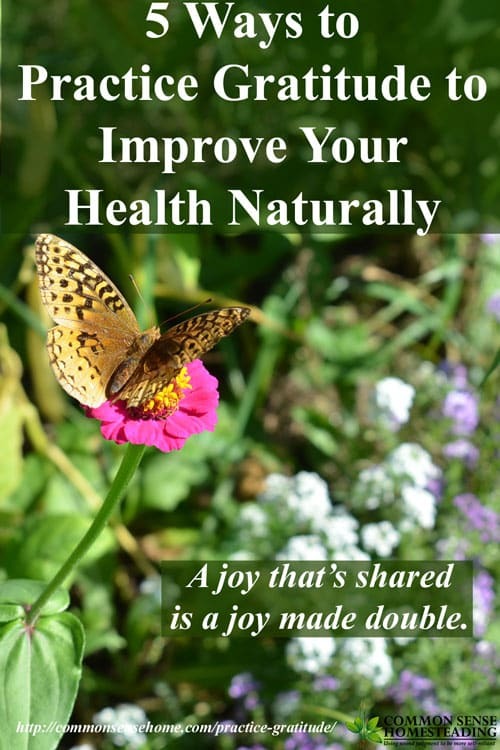 Healthy mind + healthy body = a more productive day and a happier life. Self-reliance focused or not, that's something everyone can benefit from, right? To start out the new year, I've pulled together 5 simple behaviors that you can use every day to improve your mood and focus on your blessings. Your journal can be as simple or as fancy as you like – from a spiral notebook to a bound journal. Just take a few minutes each day to write down a handful fo things your thankful for – a smile, a sunset, a new opportunity, a good friend – whatever brings you joy during your day. Even if you have to fake it, putting a smile on your face is one of the quickest, easiest ways to boost your mood. Just think of something you are grateful for, and get that smile on your face. How often do we go through our same routine, day in, day out, taking those in our lives for granted? Just take a moment to share an extra “thank you”, or a few minutes to sit down and write a thank you note or letter. You'll find it's hard to focus on being grumpy and being thankful at the same time – and thankful usually wins. Plus, you spread the good juju to someone else – win-win. My sister used to have a bumper sticker that said, “It's hard to fly with eagles when you work with turkeys.” (She worked at a turkey plant at that time.) While I appreciate the humor in the sentiment, it also conveys a simple truth – we tend to reflect the behaviors and attitudes of those we spend the most time with daily. If you are constantly surrounded by people who do nothing but complain, odds are it will drag you down to the same mood. If you spend time with positive, upbeat people, it'll work just the opposite. Often we don't have a choice about avoiding some problem individuals, but we do have a choice about making sure to include more positive people in our days. Talk to a good friend, and make a promise to hold each other accountable to sharing good news and things you are grateful for on a daily or weekly basis. You'll be glad that you did. Going to bed with a more positive mindset can help ease stress, relax the body, and allow for deeper, more restful sleep. Today’s society often leads us to focus on what we don’t have rather than what we do have. We’re told that if only we buy the newest clothing, the latest electronic gadget, the bigger house – then we’ll be happy. Taking a break from all the materialism is easier on our wallet (much needed by many of us in these uncertain economic times), easier on the environment and better for our health. This year, be thankful for what you do have, and pass the benefits along by thanking someone who has made a difference in your life. Thanks for linking your great post to FAT TUESDAY. This is a WONDERFUL post.I am really looking forward to your November posts about gratitude. I really like how you site the science behind the benefits as well. We all need to be reminded about the positive side of life and cherish our good fortune — something many people forget about. Hope to see you next week! Thanks, Jill. I was having a hard time taking my own advice today – lots of little snafus. Hopefully tomorrow will be a little smoother. I’M GOING TO TRY THE JOURNAL, OR AT LEAST THINKING WHAT I’M GRATEFUL FOR EACH DAY BEFORE BED. THANKS FOR THE GREAT POST. It’s a good way to wrap up the day!